The Datalink Service Load Balancing or DSLB, also known as Uplinks Load Balancing, allows to create high available and WAN scale of Internet Providers uplinks at layer 3. The DSLB farm profile allows to create a routes based farm where the backends are uplink routers or gateways. This kind of farm profile is ready to share several uplink WAN router accesses using the load balancer as an uplink channel multiplexer (1 input and several router line outputs). Therefore, the DSLB farms could be used as high available communication links and additionally could be used as bandwidth scaling joining the amount of bandwidth between the routers backends links. In the scheme below is shown the use case for load balancing several uplinks with different weights. Create Farm. Create a new farm managed by the DSLB farm profile. Restart. Stop and start again a farm service in the DSLB farm profile. Delete. This action stops the services and deletes the farms configuration. Farms listing with the properties of every farm. The fields shown per farm are described below. VIRTUAL IP. 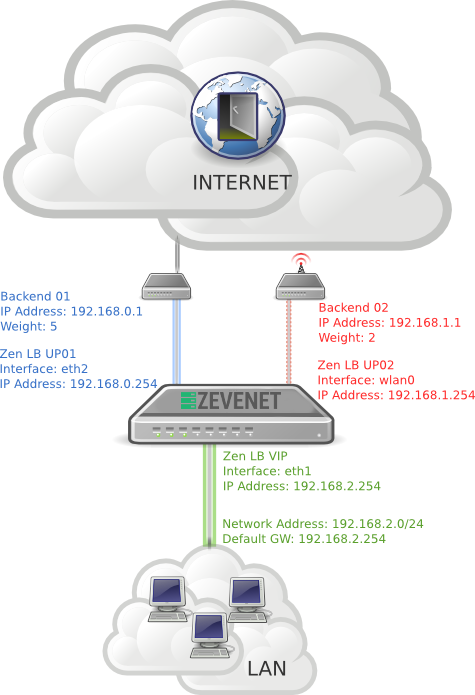 IP address that is managing the incoming local traffic, it’s also known as the virtual IP that could be moved to another node of the cluster. This IP address would behave as the LAN default gateway. INTERFACE. Network interface that is managing the incoming traffic and shares the requests among the WAN networks. Red: Means DOWN. Farm is stopped. Stop. 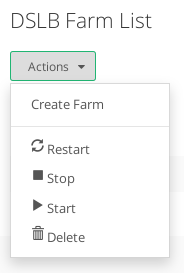 This action is only available if the farm is running and all the traffic managed by this farm will be dropped once the button is pressed. Start. This action is only available if the farm is stopped, the service will bind to the configured IP and interface and hence the traffic through them will be handled by the farm. Delete. The Farm will be stopped and all the configuration files deleted. The IP will be released so it could be used by another farm. Next step, create a DLSB farm.